This memoir of fictional Chinese artist, Little Winter, is written for her American daughter. It takes the story of Communist China beyond the death of Mao and for the first time in fiction shows the birth of the radical art movement, The Stars, in 1979. Freelance writer, author and speaker, Sylvia Vetta took up writing in 1998, when she began writing features for the award winning magazine of The Oxford Times. Sylvia has a lifelong passion for China. 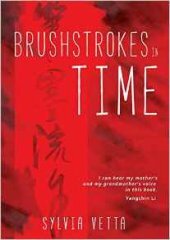 Her extensive interviews with Stars art movement founder, Qu Leilei, inspired her to write Brushstrokes in Time. Yangchin Li: "I can hear my mother's and my grandmother's voice in this book." Tonia Cape Bowley, South African author: "charming, captivating, educational, gripping, evocative, heart-rendering, challenging, inspiring...and so much more." Frank Sieren, best-selling author, documentary filmmaker: "This moving story...gives us an engaging heroine who rises above oppression to discover love, hope, and success." Michael Smith, best-selling author of Station X: "Well-told and in a very appropriate and enchanting voice." Jan Lee, Oxford Times: "Vetta's accomplished, harrowing, and powerful book is shot through with humanity." Paul Harris, chineseart.co.uk: "Perhaps because it is so skillfully executed by Sylvia Vetta, I had considerable difficulty in seeing this book just as a novel."